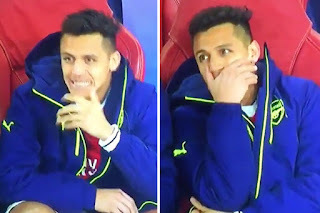 Petr Cech has defended Alexis Sanchez's laughter while on the bench against Bayern Munich in the return leg of their last 16 tie last Tuesday. The Chilean was seen laughing as his team were being ripped to shreds and this made supporters hit out at him as they tagged his action 'a show of shame'. Cech however expressed disappointment in those who criticized Sanchez saying the forward's act was misinterpreted. He claimed the star was as pained as every other person linked to the club. “It is sad and he was as sad as I have seen him,” he said via Standard Sport. “Unfortunately when you say the sentence, ‘had we scored the second goal, everything could look different’ and then you say ‘ooph’…you know, but in the end, the reality is you are 5-1 . “I found it very disrespectful to the player. But obviously you can take the picture and you can interpret it the way you want, unfortunately.